By The Bates Shoe Co. Size medium. 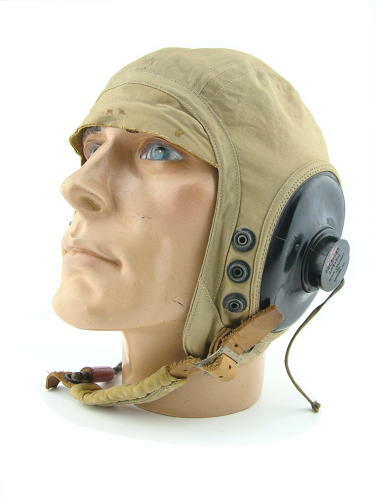 Unlined tan cotton summer flying helmet. The cloth is in excellent condition bar light soiling. The rubber receiver carriers and straps are also very good. Early production version without leather reinforcement for the oxygen mask studs. Good chinstrap complete with velveteen pad. The inside of the helmet is clean suggesting little use. Nice clear AAF label and AAF ink stamp. Wired with a standard 'Y' loom, red PL-354 jackplug and ANB-H-1 receivers by Radio Speakers Inc. Very good + - excellent used. Stock code H22273.